My second sewing project! 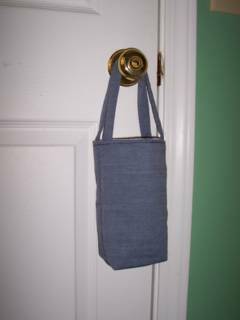 It's a little totebag that is kind of a weird size because I was using scraps. I think a water bottle would fit in it nicely. I made it following guidelines from this online tutorial. I plan on making a larger one soon when I have more material. Maureen...Love your blog (and the crafty links you include). I've become a bit of a sewer myself (have made various bags, curtains, roman shades, etc.)... Knitting is another story - I tried to teach myself last year and failed miserably...Anyway, just wanted to let you know that I enjoy seeing all of your projects and reading about how you and Matt are doing! I am so impressed!! You certainly didn't get any sewing ability from me. Now you will be wanting to hit the fabric stores also. Have fun! !